Star galloper Dissident won his fourth Group One race with a runaway win in yesterday’s CF Orr Stakes (1400m) at Caulfield. At his second start since a stud deal was clinched and he was transferred to the colours of new part owner, the China Horse Club, Dissident gave his army of connections plenty to cheer about when he cruised home in the feature weight-for-age contest. The son of Sebring sat just behind the leaders for much of the race before coming with an electrifying sprint in the straight, reeling in the leaders and then clearing away under Ben Melham to win by a length and a half. Dissident turned out a brilliant investment for his original connections, who through trainer Peter Moody, paid $210,000 for the colt from the draft of Widden Stud at the 2012 Magic Millions Gold Coast Yearling Sale. Moody has always held Dissident in high regard and the CF Orr Stakes was another feature for the exciting stallion prospect who will retire to stud this spring at Newgate Farm. “He wasn’t suited first up at Moonee Valley but at seven furlongs or the mile in these conditions he’s almost unbeatable,” Moody said. Dissident would have another run in Melbourne before connections to a possible trip to Sydney. At all times they will keep a close eye on the weather. “He’s not at his best on soft ground,” Moody noted. Dissident is a true Magic Millions product. Not only was he purchased from the 2012 Gold Coast Yearling Sale himself, his sire and dam, both stakes performers, were also sold through the same sale ring. 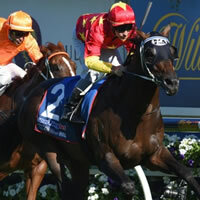 His sire Sebring won the Golden Slipper for Star Thoroughbreds and Gai Waterhouse among a five win juvenile career. As a sire he’s been a huge success with 114 winners including 11 stakes winners – among them Criterion, Bring Me the Maid, Believe Yourself, Thurlow and Dissident. Dam Diana’s Secret won two races, including one in Melbourne at two. She earned black type with a runner up finish in the listed Hill Smith Stakes at Morphettville. Diana’s Secret in turn is from the winning Western Symphony mare Palace Scandal – a winning half sister to stakes winner Mountebank and daughter of triple group winner Palace Gossip.